Hard to beat for puncture protection & durability – and almost every wheel size is catered for! This tyres features: GreenGuard. The highly elastic, India rubber layer is 3mm thick. Other manufacturers such a tyre "Plus". However, Green is not just the colour, but also the philosophy: One third of the GreenGuard is made up of recycled latex products. "Anti-Ageing". The completely new sidewall construction can withstand for much longer the typical cracking resulting from overloading due to insufficient inflation pressure. Also the new Endurance Compound substantially increases durability. E-Bike Ready. The new Marathon has been designed for use on all types of E-Bikes. The following sizes bear the ECE75 mark, suitable for the use on faster, up to 50kph E-Bikes. 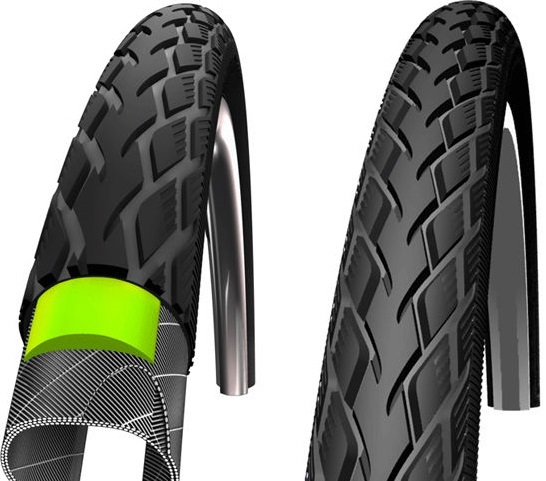 These tyres are designed to meet the rigours of city/trail riding and will fit Hybrid styled bikes, they are wider than a road race tyre to offer a larger contact area with the road and will provide more comfort. Wider tyres are less prone to punctures and will provide more grip. Within this range we offer semi slick or knobbly tyres, the semi slick tyres will be ideal for road use and the knobbly style will provide more grip for light trail use or loose surfaces such as gravel.